Excel formulas are easy to create and edit in Excel. You can easily edit a formula through the formula bar or directly in the cell. While this makes it convenient to create formulas in Excel, it comes with a few disadvantages as well. You are going through a worksheet full of formulas, and you accidently hit the delete key, or backspace key, or some other number/alphabet key. Now you’ll be lucky if you’re able to spot the error and correct it. But if you are not, it may lead to some erroneous results. And let me tell you this, errors in Excel have cost millions to companies (read this or this). The chances of such errors increase multifold when you share a file with colleagues or managers or clients. One of the ways to prevent this from happening is to lock the worksheet and all the cells. However, doing this would prevent the user from making any changes to the worksheet. For example, if you’re sending a workbook to your manager for review, you may want to allow him to add his comments or change some cells. A better workaround to this is to lock only those cells that have formulas in it. By default, all the cells are locked in Excel. Only when you protect the locked cells can you truly restrict the user from making changes. This also means that if a cell is not locked and you protect it, the user would be able to make changes. Select all the cells and unlock these. Select all the cells that have formulas (using Go To Special). While you may find it confusing, bear with me and keep reading. As I mentioned, only the cells that are locked as well as protected can truly be restricted. 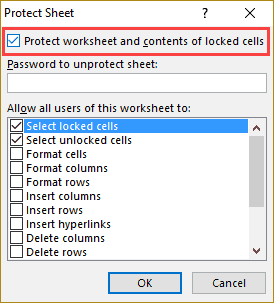 If all the cells are locked, and I protect the entire worksheet, it would mean a user can’t change anything. But we only want to lock (restrict access) to the cells that have formulas in it. To do this, we first need to unlock all the cells and then select and lock only those cells that have formulas in it. Select all the cells in the worksheet (use the keyboard shortcut Control + A). Use the keyboard shortcut Control + 1 (hold the Control key and then press 1). This will open the format cells dialog box. 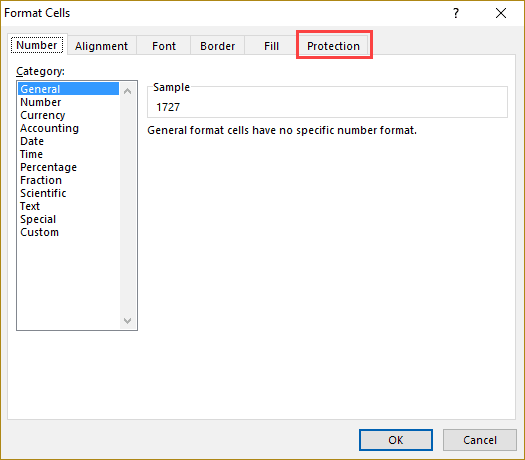 In the format cells dialog box, select the Protection tab. Now that all the cells have been unlocked, we need to make sure that the cells that have formulas are locked. To do this, we need to first select all the cells with formulas. Select all the cells in the worksheet (use Control + A). Go to Home and within the Editing group, click on Find & Select. From the drop down, select Go to Special. 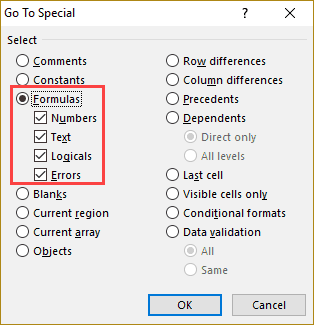 In the Go To Special dialog box, select Formulas. This would select all the cells that have formulas in it. Now that we have selected the cells with formulas, we need to go back and lock these cells (enable the lock property that we disabled in step 1). Once we do this, protecting the worksheet would lock these cells that have formulas, but not the other cells. With the cells with formulas selected, press Control + 1 (hold the Control key and then press 1). Now that the ‘Locked’ property is enabled for cells with formulas (and not for other cells), protecting the entire worksheet would only restrict access to the cells with formulas. 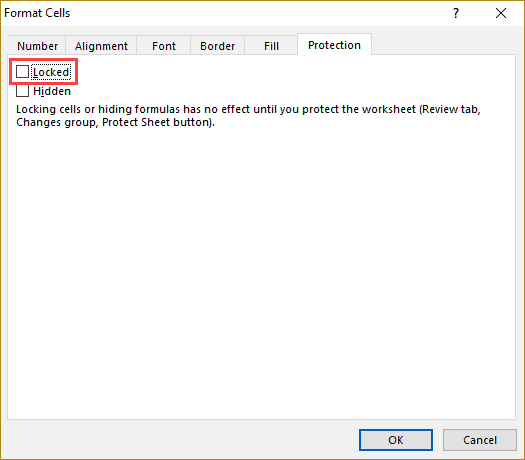 In the Protect Sheet dialog box, make sure the option ‘Protect worksheet and contents of the locked cells’ is checked. Once you are done with the above four steps, all the cells that have formulas would be locked, and the user wouldn’t be able to change anything in it. When you lock formulas in Excel, the user can’t make any changes to the cells with formulas. However, if that cell is selected, the formula in the cell would be visible in the formula bar. While this isn’t an issue in most of the cases, but if you don’t want the formula to be visible, you need to hide it. Click OK. This will select all the cells that have formulas in it. Press Control + 1 (hold the control key and then press 1). This will open the format cells dialog box. In the Format Cells dialog box, go to Protection tab. Now, when the user selects a cell that has a formula and is locked, he/she will not be able to see the formula in the formula bar. Note: As mentioned earlier, a cell that has not been locked cannot be protected. The same applies when you hide formulas in Excel. Unless the cell is locked, only checking the Hidden checkbox wouldn’t do anything. 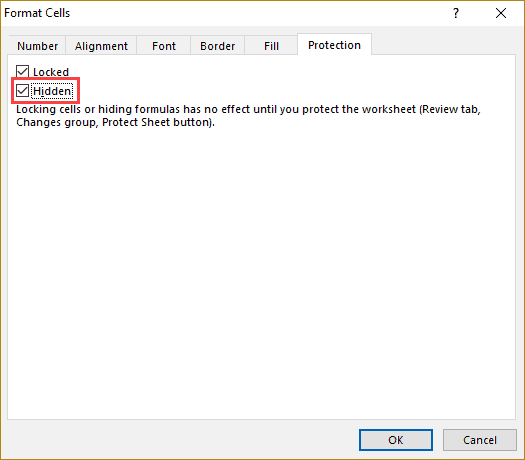 To truly hide formulas in Excel, the cells should have the Locked and Hidden check boxes selected, and then it should be protected. Lock Rows/Columns using Excel Freeze Panes. How to Copy and Paste Formulas in Excel without Changing Cell References. How to Convert Formulas to Values in Excel. Your instruction locks the entire worksheet. I am trying to figure out how to simulate a basketball score spread sheet that will generate a random score between selected integers for each of four quarters (or two halves) for several different teams during a playoff tournament. I know how to generate random numbers and to total the four quarter scores but how can I repeat this several times for each of 16 (or more) playoff games? I am fascinated by these formulas. The article proved very helpful. It gave me all what i wanted. Very clear and easy to understand instructions. Thank you. Thank you for the kind words Priscilla! Glad you found the tutorial useful. Can this be applied to an entire FILE, not just the worksheet? Thank you! I just found your site, and it has already helped me immensely. Your instructions are wonderfully clear and detailed just enough without going overboard. Awesome! Hi. Nice article. There is no thing more evil to do than to hardcode a value to a verification column. There is a typo in the section How to Lock Formulas in Excel in the second step 2. Select all the cells that have formulas (using paste special). 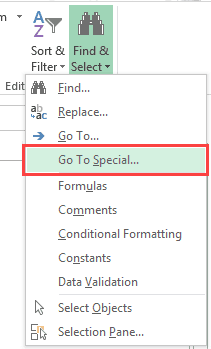 It should be Go To Special, not paste special. Typo can cause confusion.